Sonoma County Adult Education (SCAE) provides free adult education and opportunity to mostly underprivileged and immigrant communities that otherwise would be left behind. SCAE provides courses, classes, and resources at various campuses throughout Sonoma County and needed a centralized location to allow their students to learn about what SCAE offers as well as drive them to the programs that they are looking for. Never having a website previously, we had to start from scratch to better understand their audience, needs, and structure. Learning that their audience most likely was going to be accessing the site from a mobile device, it was important to start with a mobile-first approach.Additionally, from our research and discussions with SCAE, we knew we needed to keep the User Experience as simple, obvious, and straightforward as possible. SCAE provided us with the core content and we helped massage it into something that would fit into the overall information architecture of the site and easily understandable by multiple audiences. SCAE had existing brand standards which we built off of and used a mix of SCAE’s photos and stock images that portray their audience. Through the use of “success stories” and visual organization of the programs offered, the goal was to give potential users a feeling that they could achieve anything they put their mind to and SCAE gives them the tools to do so. The process of building a website often forces companies and organizations to really think about who they are, what their processes and systems are and organize themselves and their messaging into something that is cohesive and understandable. It’s one of the only times that everything under the kitchen sink is organized and consolidated in one location. SCAE was a prime example of this. SCAE has a complex registration and onboarding system with multiple registration locations, multiple orientation locations and multiple classroom locations that were previously facilitated (and still somewhat is) by human contact via phone, email or in person. We worked with them to find patterns and build a custom course management system as well as to streamline the onboarding process. Our goal was to break down the onboarding process into as few steps as possible and make sure the users were not lost in the process. 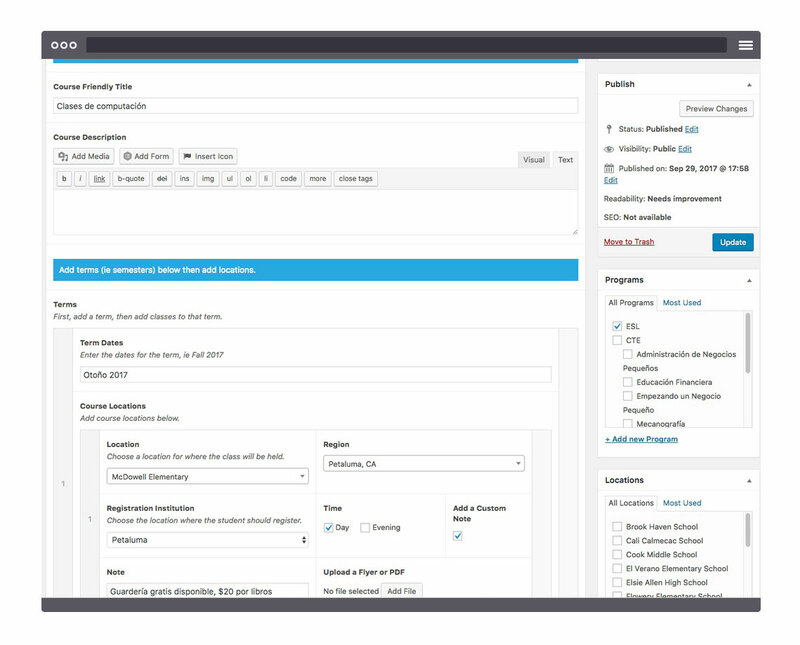 We built a custom courses module allowing SCAE to manage course and program offerings including a user interface for students to quickly view open classes including their location, time and automatically align the “registration” call to action with where the student needed to register. This also aligned with a “Register for Classes” page that clearly laid out the steps to take a class. One of SCAE’s largest audiences is Spanish speaking. From the outset, one of the major requirements of the site was that it needed to be multilingual. To start English and Spanish, but have the capability to be translated into additional languages in the future. 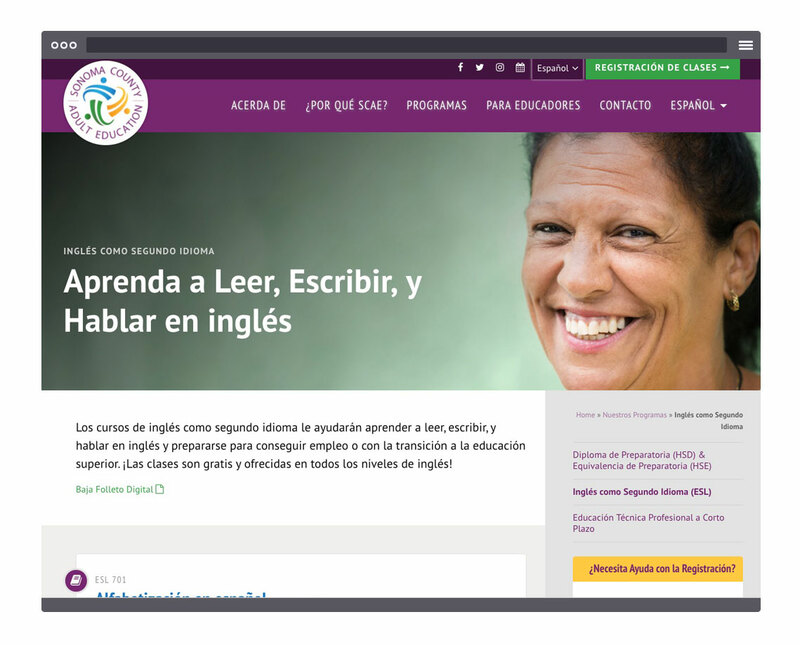 Using WordPress and Polylang, we integrated a solution to give them both English, Spanish and options for additional languages in the future with the ability to manage all the content from one centralized WordPress admin.